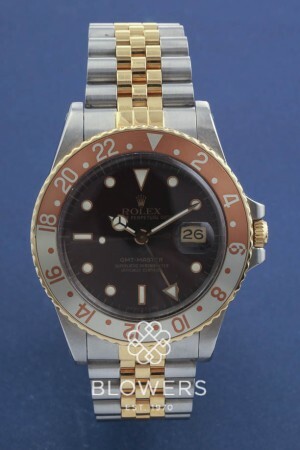 Bi-metal Rolex Oyster Perpetual GMT-Master 16713. Automatic chronometer movement. Case diameter 40mm. Water resistant to 100 meters. Bronze dial with applied dot and index hour markers. Two tone "Root Beer" bronze bi-directional 24-hour. Bi-metal Jubilee bracelet with folding clasp. Box and papers dated March1989. SKU: 3007273. Categories: Gents, GMT-Master, Rolex.